The information that you volunteer to pass on to Worldwide Dream Villas is collected only to ensure your travel arrangements run smoothly. It is standard and normal procedure when booking a holiday, to provide a name, address contact telephone numbers, e-mail or credit card details, whether on-line or over the telephone. Worldwide Dream Villas will hold this information to update you in the future, or monitor the effectiveness of our web-site and advertising. This helps us to ensure we are understanding our customers and what their needs. 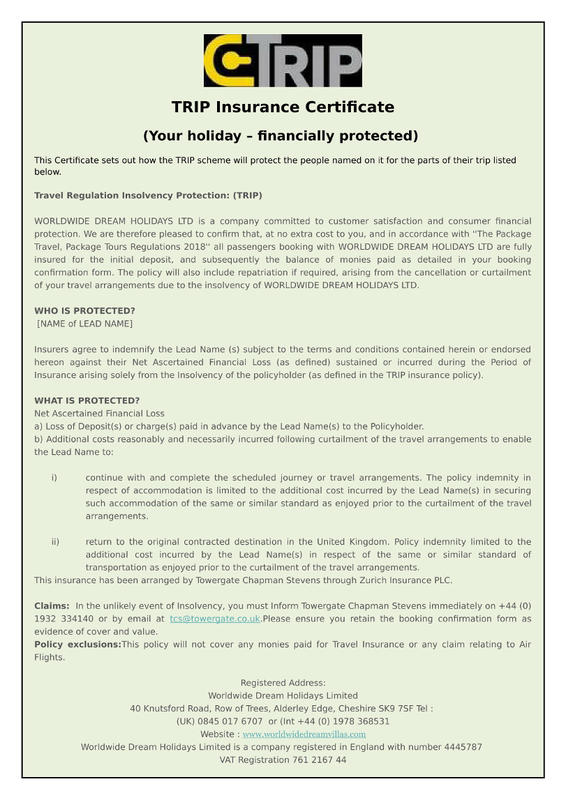 Any information you provide will only ever be passed on to any relevant suppliers/third parties involved in your travel arrangements, such as villa owners, transport suppliers etc or it may also be provided to credit card companies, public authorities if required by them or as required by law. If your chosen holiday is outside the European Economic Area (EEA) there may not be the same levels of control and protection as the standards set in the UK. Worldwide Dream Villas are not responsible for the privacy policies on other web-sites you may link to. By providing Worldwide Dream Villas with your personal information either via the web-site or over the telephone you have granted consent for Worldwide Dream Villas to storing and utilise the information as outlined above.